A Home Remedy for Hair Loss and Hair Regrowth That Actually Works! A Home Remedy For Hair Loss That Actually Works! I managed to stop my hair falling out and restore healthy hair regrowth using my own home remedy for hair loss. This page explains how I did it and how this new natural approach to hair loss can help you too. I needed help. And I needed it fast! So, obviously my first approach was to ask the experts. Being very technically minded, the questions I posed to these hair loss professionals were quite specific* about the hair loss process. * I wanted to know why the rate, region and age at which hair loss starts can vary so much. I also asked why the hormone dihydrotestosterone (DHT) can be linked to both hair loss and hair growth. But Every Hair Loss Expert I Asked Was Unable To Provide Answers! This, I found extremely surprising and disappointing because it gave the impression that they didn't fully understand the hair loss mechanism. And if they didn't know, how could I ever rid myself of this problem? But I had to find a solution. Even if it meant doing it on my own! So that's when I started what was to become extremely time-consuming work: finding the answers to those questions. Whether or not skull expansion and hair loss develops, all depends upon the shape of your skull. During my research I managed to identify the skull bones that keep growing in men and women with certain skull shapes. Then, as these bones grow, they increase the curvature of the skull and slowly push up against the scalp tissue, disrupting the tiny capillaries and choking the blood supply needed to grow hair. Just read the skull expansion﻿ section if you’re in any doubt. Once I realized that skull expansion was causing the problem, I began developing techniques to try and counteract the hair loss process and so find the remedy I wanted (needed!) so much. I had to experiment of course, and ended up trying several ideas. But, eventually, I found success. I finally settled on the ideas that seemed the most promising and started using them every day. Very soon I noticed a decrease in the rate of hair loss. And within about a month, my hair loss had virtually stopped. Within a few more months, I realized that my hair was also getting thicker and starting to grow in previous areas of loss. And this new hair growth was mature "terminal" hair, not just tiny "vellus" hairs. The techniques that formed my home remedy for hair loss were so effective in fact that today, no one would ever really know I suffered any serious hair loss at all. 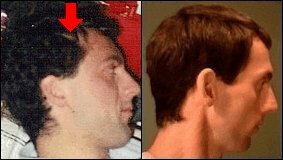 From the two photos of me below, you can see in the left picture how my temples had begun to rapidly recede. The picture on the right shows how hair growth has now recovered in this region. After all those years, I had finally developed a remedy for hair loss that really worked. The techniques I used are now helping many others save their hair too. So, whether you're male or female, if you're worried about how much hair is falling out and prefer the idea of a safe, natural, made-at-home remedy for hair loss rather than expensive products, drugs, lasers, etc, you can now try these techniques yourself. Try my home remedy for hair loss.